About 9to5Blogger.Com and its Author "Radha Krishna"
Hi Friends, this is Radha Krishna, the author of 9to5Blogger. I don’t call myself an entrepreneur as I am not yet a full-time blogger. I’m 25 years old and I’m working on Web Analytics for one of the most successful digital marketing agencies in India. 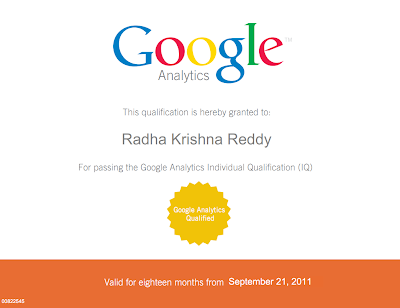 I did my Masters PG in Computer Science from Andhra University. Although, I started Blogging 5 years back, I used to work only part-time on my blogs and I still manage to earn few thousand dollars each month by serving third-party advertisements on my blogs and also through affiliate marketing. Keep in touch with me on Facebook, Twitter, LinkedIn and Google+. TeChZeNe – It’s a technology blog that covers topics related to computers, internet and how-to guides. Dr.HealthTips – You can find the useful health tips for good health, beauty tips, body fitness guides, Yoga techniques, healthy recipes & lot more. And several other micro-niche blogs which I can’t list out here. Every blogger’s sole dream would be to become a full-time blogger at some or the other point of time. Full-time job requires you to work from 9AM till 5PM (most cases) and the same dedication is required for a blogger. He should choose a proper work schedule or else he’d end up with having several health related problems. This idea made me to name this blog as “9to5 Blogger”, a blogger who works from 9AM till 5PM i.e., full-time on his blogs. At 9to5 Blogger, I write articles mostly on Blogger Tips, WordPress Guides, SEO Tips and Webmaster Tutorials. Although these articles have been covered by many bloggers out there on their blogs, I try to write them in-depth and in simple English, so that a blogger having no technical knowledge can easily understand. Stay updated by friending us on Facebook, Twitter, YouTube, FeedBurner and Google+. Update [Sep 5, 2012]: I’m now a Full-time Blogger. Oh cool.Nice to meet you bro. I run Myself Onlydigit technology Blog. I welcome you to write guest articles on blog. I also need your small help in monetization my blog. Thanks. This blog doesn’t contribute much towards bluehost but my other blog (Techzene) does. And I’ve a micro-niche blog dedicated to bluehost which is doing well. Good to know about you buddy.. amazed to know your success and wish you a very good luck..! tell about your micro niche site on bluehost.